A strong first half filled with online gaming gags fails to save an otherwise mediocre episode of Wotakoi. Chibi online avatars of the cast are comical and match the character’s personalities. Kabakura is a warrior, always ready to go on the offensive with a menacing aesthetic, while Narumi appears to be a cutesy summoner class. However, despite her appearance, Narumi is actually an assassin driven by greed to kill all enemies. Defying perceptions is the first half of episode 7’s theme. The episode sets up Kabakura as high level, only to be greatly surpassed by Narumi. Meanwhile, Nifuji is described as a solo gamer reluctant to interact with others or even play online games. This characterization is shattered when Narumi joins the rest of the cast in-game and one-shots a powerful rare enemy. The sudden appearance of the rare dragon was the best part of the episode. Everyone’s antics translate perfectly into their avatars. The scene comes together in an even greater failure than you’d expect. Koyanagi wastes magic bickering with Kabakura, Narumi naively dashes toward the dragon, and Nao—who logged in as Nifuji—has absolutely no idea how to do anything. There’s a lot more material to work with in terms of online gaming scenarios, so hopefully the show has another online gaming segment. The second half of the episode featured unnamed side characters, which is normally no big deal for an anime, but this is the first time the cast has interacted with other people for more than a few seconds. Narumi and Koyanagi argue over the role of their boyfriends in a hypothetical boy’s love scenario. On the other hand, the guys grab dinner with two of their junior coworkers. Laugh-out-loud moments are less frequent compared to last episode because the dinner portions drag on. They feel longer than they should and extend jokes that aren’t entertaining enough to warrant extension. For example, the coworker’s commentary about Narumi and Koyanagi leads to the typical reactions you’d expect from Nifuji and Kabakura. Additionally, the women’s argument goes in circles with no new punch line. The second half of the episode splits the characters into different scenes, and also drops the episode’s level of entertainment. 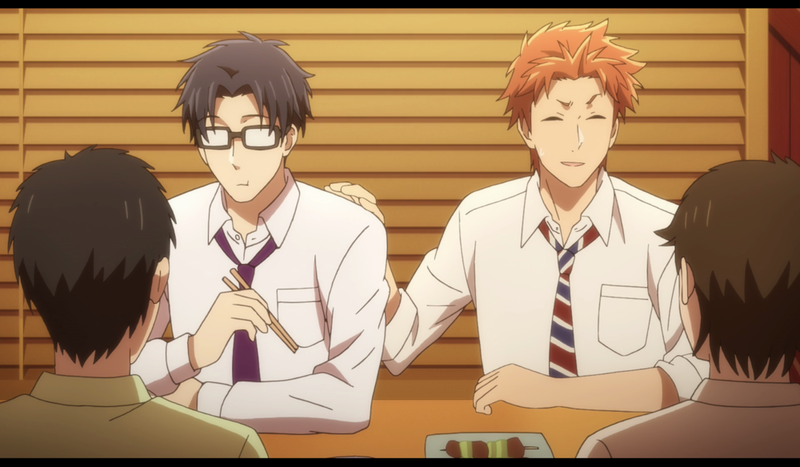 The strongest episodes of Wotakoi feature memorable moments when the entire cast is together, something the second half desperately needed.